Consider the heartbreaking situation the Levite woman finds herself in. She is a slave. After Pharaoh’s pronouncement that all newborn boys must be killed, she gives birth to a beautiful baby boy. The Levite woman cannot bear to lose her son, and so she hides him for as long as she can. When she can no longer hide him, she places him in a waterproof basket, pleading in her heart that the impossible might happen, and someone—anyone—might come and save him. Consider the heartbreaking situation Moses’ sister finds herself in. She watches her mother, desperate and despairing. She listens to her baby brother’s cries, and she can do nothing but watch. Consider the heartbreaking situation Moses finds himself in. He is born to an oppressed people who are enslaved and murdered with full governmental and societal approval. His life is to be taken before he gets a chance to live at all. Now consider the compassionate providence of God. The daughter of Pharaoh comes to bathe in the river at exactly the right time. She is curious about the basket when she does not have to be. She takes pity on the child when her entire nation fears and hates the Israelites. Moses’s sister is on hand to ask the perfect question, and so Moses’s mother is paid to nurse her beloved son. In our own lives, we come across heartbreaking, impossible situations, more often than we would like. We are not guaranteed a fairytale ending to every story, but we can count on our compassionate Father to be present, to be actively at work, and to passionately pursue our good at every turn. In our world, we come across heartbreaking, impossible situations more often than we are aware. When we are removed from the suffering, as Pharaoh’s daughter was, we have the option of closing our eyes and our hearts. May we proactively go to the hurting, be His hands and feet, and bring His compassion to the world. Prayer: Father, I thank You that You see and act in my times of need. Give me Your love that I might see the suffering of those around me, and that I might act to make Your love and power visible to hurting people. Amen. Read Psalm 68:4–10 (ESV): Sing to God, sing praises to his name; lift up a song to him who rides through the deserts; his name is the LORD; exult before him! Father of the fatherless and protector of widows is God in his holy habitation. God settles the solitary in a home; he leads out the prisoners to prosperity, but the rebellious dwell in a parched land. O God, when you went out before your people, when you marched through the wilderness, Selah  the earth quaked, the heavens poured down rain, before God, the One of Sinai, before God, the God of Israel. Rain in abundance, O God, you shed abroad; you restored your inheritance as it languished;  your flock found a dwelling in it; in your goodness, O God, you provided for the needy. According to vv. 4-6, why is God worthy of worship? According to vv. 7-10, what did God’s love for the downtrodden lead Him to do? How should God’s people respond to His great compassion? Among endless other reasons, God is worthy of worship because He loves and protects the oppressed and helpless. He takes notice of those who are suffering alone (orphans, widows, prisoners) and restores them. In the wilderness and even in the Promised Land, God provided food and protection for the needy. His love was extended in very practical ways as His people followed Him. We should frequently remember His good deeds, sing and declare His goodness, and care for those whom He cares about. Reflect upon your day. 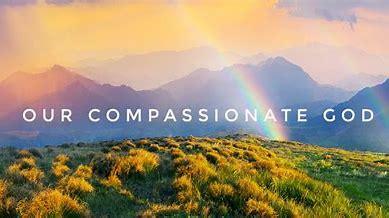 Was there an instance when you needed God’s compassion? Bring your burdens to Him now. Did God give you an opportunity to demonstrate His compassion for others? Pray for them as well as for opportunities tomorrow to love as He loves.